If the UK government is turning waste away from landfill where is it going? Incineration is on the rise in the UK, and with energy recovery (EfW) provides an attractive option. 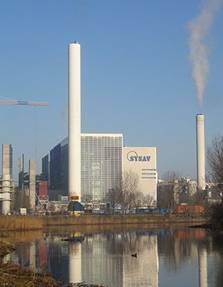 At present incineration has a very negative public perception this can be overcome with government funding for the following projects. A key factor is that these plants are CHP plants, with greater efficiency. Approach 1 - Subsidise development of CHP EfW. Most standard power plants achieve around 60% efficiency, after driving turbines to create power large quantities of heat are vented, CHP captures this heat and distributes the heat (as steam) to near buy industrial / commercial / amenity and residential sites, achieving efficiencies of up to 90% - 95%[iv] in the process. At present 1 MW of heat is worth 25% of 1 MW Electricity, this is the main factor in the absence of CHP in the UK, ROCs have gone some way to addressing this with regards to renewables but for CHP in waste incineration there is little incentive. Funding could be sought from the climate change levy, as EfW is effectively meeting a percentage of UK energy supply that would be met from fossil fuels which contribute to global warming. 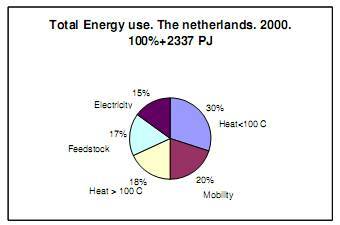 CHP makes sense as most of the energy we use is used for heat, as the above graph shows. Heat can be used for cooling too. Unnecessary conversion of heat to electricity and then electricity to heat further adds to inefficacy. Incineration is extremely well regulated, in terms of emissions, under EPR. As such the main emphasis of change should be placed on getting as much energy recovery from waste as possible. This means CHP. Sourcing Power from waste aligns very well with the what might be considered to be an emerging energy crisis, nuclear plants are aging with replacement 25 years away, renewables are not being implemented on a large enough scale. Many argue that Incineration will detract from recycling rates, but the UK stands to gain far more from energy recovery than it does from shipping wastes back to China / India for reuse. In many respects on a global scale it is more responsible for us to deal with our waste here in the UK. NGOs such as Friends of the Earth have always sought to disrupt planning applications for incineration plant[vi] on the grounds that they drive out recycling, but in areas like Portsmouth there is no-were even to put the residual waste that cannot be recycle, so incineration is the BPEO. Encouraging Incineration will result in Landfill Waste being greatly reduced, or perhaps eliminated. In Japan manufacture of paving slabs from incinerator ash results in no waste at all. Cons: BIG infrastructure costs, laying steam piping etc, disruption to local traffic etc, during works. Increased road traffic in vicinity of plants. Approach 2 - Lessen the influence of public consultation in the planning process. Would you ask a member of the public for advice on dentistry or medicine? No. So why ask for their opinion on a complex CHP incineration plant. Public consultation within the planning process gives far too much opportunity and influence over the outcome of an incinerator project. All too often sit on the fence solutions such as MBT are used, when incineration is obviously the answer. The Infrastructure planning commission is an independent body set up by the government to make sure that Infrastructure projects go ahead. It would be prudent for the IPC to ensure the construction of a number of CHP incinerators in the UK. The Netherlands has a population of 16 million and runs 11 EfW plants, small scale is necessary to maximise benefit from localised heat distribution, on like for like basis it would be prudent to build around 40 - 45 plants in the UK. Urgency is certainly required. Pros: Things would get done, projects started and finished. Cons: People will not like the government. Approach 3 - Export Tax on Combustible Waste. By forcing the hand of potential waste exporters, more waste would be available for incineration. Keeping the domestic cost low and enabling cheap production of power, waste is a resource we can use at home, why send it abroad. Pros: More waste available for incineration. Cons: We are incinerating a finite resource when we burn oil based plastics. Case Study - CHP in Scandinavia: The Swedish have long recognised that CHP is an excellent way to maximise energy recovery both from waste and fossil fuels. A lot of local businesses and homes will have benefitted from cheap heat from the plant, which will have no doubt gone a long way to overcoming public opposition to the plant. Perhaps instead of building Gas fired Power stations the UK should follow Sweden’s example.